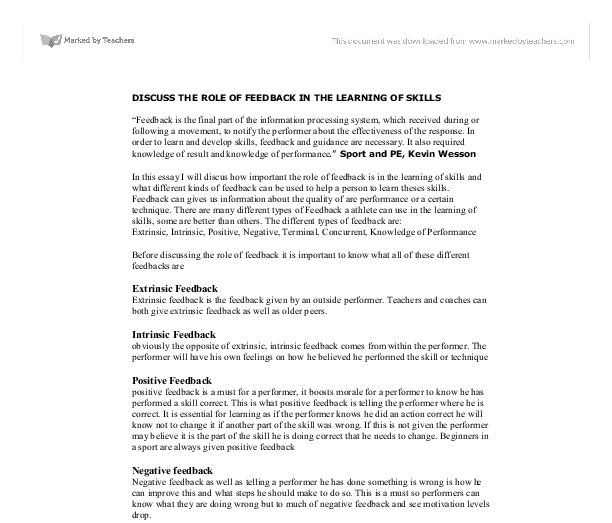 DISCUSS THE ROLE OF FEEDBACK IN THE LEARNING OF SKILLS "Feedback is the final part of the information processing system, which received during or following a movement, to notify the performer about the effectiveness of the response. In order to learn and develop skills, feedback and guidance are necessary. It also required knowledge of result and knowledge of performance." 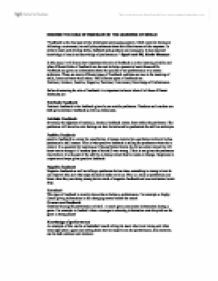 Sport and PE, Kevin Wesson In this essay I will discus how important the role of feedback is in the learning of skills and what different kinds of feedback can be used to help a person to learn theses skills. Feedback can gives us information about the quality of are performance or a certain technique. There are many different types of Feedback a athlete can use in the learning of skills, some are better than others. The different types of feedback are: Extrinsic, Intrinsic, Positive, Negative, Terminal, Concurrent, Knowledge of Performance Before discussing the role of feedback it is important to know what all of these different feedbacks are Extrinsic Feedback Extrinsic feedback is the feedback given by an outside performer. Teachers and coaches can both give extrinsic feedback as well as older peers. ...read more. Just as a 1500m athlete will be given his time for him completing the results. Feedback is essential now for performers to do well. For many the best type of feedback comes extrinsically as many people who use feedback on themselves (intrinsically) are either too critical or not harsh enough. This poses a problem as the whole point of feedback is to improve skill and motivate and by being to harsh motivation levels will inevitably drop whilst if being too soft on you a skill will never be improved to above a satisfactory level, It is vital that all feedback given is understood by the performer to improve their skills. This mean people such as coaches have a big part to play and must make sure they are neither to negative nor to positive either. A balance needs to be there. If a coach picks up on to many small errors then confidence and motivation levels will drop to much. This puts more pressure on the coach to get it right. This is the negative effect of both positive and negative feedback. For example a big error would be giving the ball away in your own half in football, this would need both negative feedback and Knowledge of performance feedback. ...read more. sport and PE (Kevin Wesson) This highlights the benefit of positive feedback which along with Knowledge of performance and Negative has to be the three best types of feedback to give a performer as they all play a big role in improving that persons skill level. The positive gives the motivation and confidence to try and strive to improve the school and the negative lets the performer know what's wrong with the skill so he can correct this and the knowledge of performance fills in the performer with what he needs to know and if he has any problems how they can deal with it. This knowledge will be both positive and negative. Without Feedback skills will never be learnt above an average way and without these three types of feedback skill will never be learnt to a almost perfect level. In conclusion feedback if used properly can be a great thing for a performer to learn new and improve skill to a higher level. By using it properly there has to be a balance or else feedback will not work properly and not have the same effect. However, if the balance is right then a performers motivation will be high and skill will be improved making it essential for a performer to have. LIAM HAYES ...read more. Disadvantages: This test is open to subjects anticipating the drop or getting cues from the 'dropper'. Having more trials and taking an average may negate the odd 'anticipated' result. Procedure: With a partner holding a metre ruler at the "zero" end, the subject places their thumb and index finger either side of the 50 cm mark, without touching the ruler. Health and Body Temperature. Ill health slows down reactions as the body is already making more decisions than usual i.e. fighting antibodies or healing wounds and broken bones. Bacterium or viruses leave the body feeling drained and weak. Ill health affects body temperature also. it prepares the body both physically and mentally for performance while guarding against injuries. The warm up has many advantages for the body, including; Muscular advantages . Exercise before performance warms up muscles and enables better ATP conversion in the muscles. accuracy, technique, timing, errors, amount , frequency ) The different types of learning: * Intellectual: Dealing with the environment in a symbolic way a person can immediately understand a skill by a certain sign e.g stop signs on the road stop, slow down etc. * Verbal: this type of learning is through stating your information/ideas through written or oral communication or body language (communication). Law of Effect: Responses are selected and connected to situations or are disconnected from situations depending upon the consequences they produce (satisfiers or annoyers). There are to types of conditioning classical and operant I am going to explain and research the both of them: Classical conditioning: This is learning by association. There is no wrong or right way to teach, yet different styles suit different situations and provide better results. Autocratic: With this style of leadership the leader tends to organise, control and exert a high influence on the task involved. Incorrect footwork on the LHS. RHS - picks up ball when stepping with left foot. -First step with right foot -Jumps off of left foot pulling right knee up. Reversed for LHS Ball Placement on Board Ball placed softly onto the backboard. crowd cheering, also how intrinsic feedback affects our sensory organs as a bad shot could leave your body sore and will affect how you do things. Furthermore, feedback will affect the response mechanism as the decisions made affect's what motor programme to use.